In the North, Italy shares the Alps with France, Austria and Switzerland. A major mountain chain, the Apennines, runs down the centre of the country. Vesuvius, close to Naples, is the only active volcano on the European mainland; Etna on Sicily is one of the world’s largest volcanoes. Milan is the undisputed Fashion capital and one of the most cosmopolitan cities in Italy, as well as being rich in artistic and cultural attractions, museums and various kinds of entertainment. Ideal destination for all shopping lovers, thanks to the great amount of boutiques in the city centre, Milan also offers a lot of cultural exhibitions such as photographic or painting exhibitions. Setting for a lot of movies, famous for its Universities and Academies and rich in musical, theatrical and sport events, Milan is also particularly appreciated by young people because of its nightlife. Italy’s most cosmopolitan city, as well as its real commercial capital, Milan not only offers a prime destination but also a perfect investment opportunity for anyone toying with real estate, be it to buy to let, buy to live or simply buy to then decide. Education, art and cultural centre, Rome is well worth visiting mainly because of its historical sites and its architectural masterpieces. Called “the EternalCity”, capital of the Italian Republic, seat of the Government and seat of the Pope, Rome is a charming and striking city, rich in history, art and culture. Clear examples are St. Peter’s Basilica, Spanish Steps, the Sistine Chapel, the Vatican Museums and so on. Almost surreal, Venice is a city where you can be invaded by art and culture while being cradled by its water. Home to the International Exhibition of Cinematographic Art, Venice is rich in cultural and artistic events and in artworks, displayed along all its alleys and streets. Ideal destination for the shopaholics, who have the possibility of visiting thousands of souvenir shops, but also for the lovers of architecture and cinema, or for tourists who simply wish to spend their holiday with a touch of romance and relaxation. Art and sculptures decorate the entire city: the domes of the churches and the Timpani Palladiani di san Giorgio, the Redentore, the Zitelle, the Angel of the Bell Tower are just a few of the wonderful attractions of Venice. Tourists are also attracted by the typical atmosphere you can find only in Venice, and by its particular events, such as the Carnival. City of art with a spectacular historical centre which has been declared a Human Heritage landmark, Florence is a well-known, not only for its schools to learn Italian, but also as a mayor tourist destination thanks to its cuisine and breathtaking panorama. In fact, from the city itself one can admire the famous hills of the Chianti area and, in the distance, the hills of the Appennini are also visible. Numerous museums and artworks attract millions of tourists, above all the Uffizi and Palazzo Pitti, together with the marvellous architecture which characterizes the entire city. In addition, for all wine and food lovers Florence represents the ideal destination thanks to its restaurants, inns and “trattorias”, where one can taste the local cuisine and accompany it with excellent wines. There are plenty of tourist attraction, such as the Cathedral of Santa Maria del Fiore, Piazza della Signoria, la Galleria degli Uffizi, Palazzo Pitti and Ponte Vecchio. 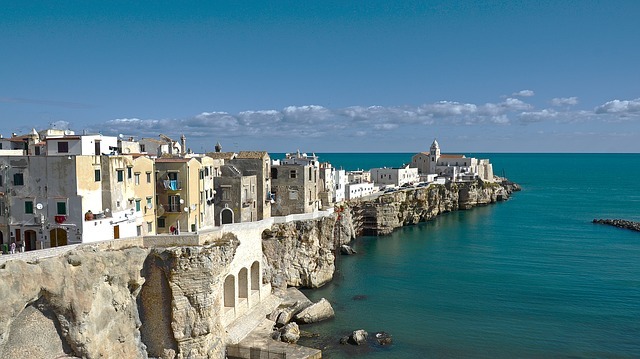 Located right on the shores of the Adriatic Sea, the provincial capital of Puglia and the second most important city of Southern Italy after Naples, Bari is a lively and growing city, combining entrepreneurial initiative of its inhabitants (see the Fiera del Levante) and the “art of getting by”, typical of the South of Italy. The city also offers an outstanding cultural tradition: in addition to the historical publishing house Laterza, the Piccinni Theatre and the Academy of Music, it will soon regain its symbol, the Petruzzelli Theatre (with works currently under way). The brand-new international airport Karol Wojtyla, with flights such as London-Bari, Barcelona-Bari, Paris-Bari, as well as from all major European capitals, make Bari the ideal destination for tourists looking for the natural treasures of Apulia and Salento, while the sea harbour make it an inevitable stop for tourist and business routes directed to Greece or to the Balkans. Bari is the perfect destination for a leisurely stay, with diverse attractions such as shopping in the elegant shops and boutiques in the city centre, a lovely beachfront panorama, sightseeing in the characteristic alleys of the Città Vecchia (the “Old Town”), and a large selection of nightspots and typical restaurants offering the renowned specialties of local cuisine. Strategically positioned in the centre of Apulia, Bari represents an ideal starting point for excursions to the nearby points of interest: the trulli in Alberobello – considered a world heritage by Unesco -, the tomb sites in Castellana, Trani, the beaches of Ostuni, the reefs of Polignano, the zoosafari of Fasano and the characteristic villages by Itria Valley – above all Martina Franca. Situated in the temperate zone and jutting deep into the Mediterranean, Italy is regarded by many tourists as a land of sunny, mild weather. However, due to the north–south orientation of the peninsula and the fact that it is largely mountainous, the country’s climate is variable. In the Alps, temperatures are lower and winters can be long and severe. Generally the weather is warm from July to September, although rainfall can be high in September. While the first snowfall is usually in November, light snow sometimes falls in mid-September and heavy falls can occur in early October. Freak snowfalls in June are not unknown at high altitudes. Mind you, with climate change, many ski resorts can remain distressingly snow-free until early January. 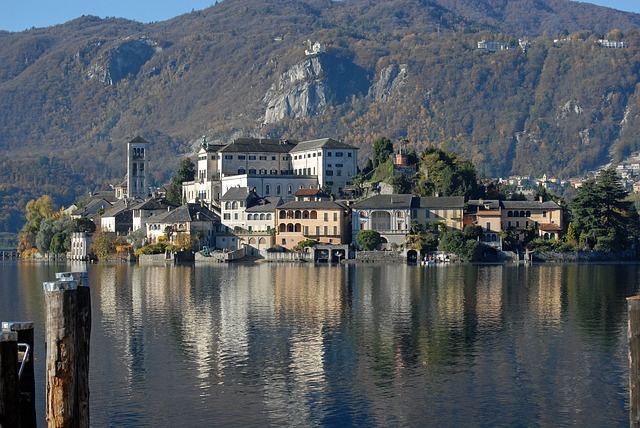 The Alps shield northern Lombardy and the Lakes area, including Milan, from the extremes of the northern European winter, and Liguria enjoys a mild, Mediterranean climate similar to that in southern Italy because it is protected by the Alps and Apennine range. Winters are severe and summers torrid in the Po valley. Venice can be hot and humid in summer and, although not too cold in winter, it can be unpleasant if wet or when the sea level rises and acque alte (literally ‘high waters’) inundate the city. This is most likely in November and December. Along the Po valley and in Venice especially, January and February can be surprisingly crisp and stunning. In Florence, encircled by hills, the weather can be quite extreme but, as you travel towards the tip of the boot, temperatures and weather conditions become milder. Rome, for instance, has an average July and August temperature in the mid-20s (Celsius), although the impact of the sirocco (a hot, humid wind blowing from Africa) can produce stiflingly hot weather in August, with temperatures in the high 30s for days on end. Winters are moderate and snow is rare in Rome, although winter clothing (or at least a heavy overcoat) is still a requirement. The south of Italy and the islands of Sicily and Sardinia have a Mediterranean climate. Summers are long, hot and dry, and winter temperatures tend to be relatively moderate, with daytime averages not too far below 10°C. These regions are also affected by the humid sirocco in summer. Whether you are searching for fashion, jewelry, furniture, glass or leather, no expense account is safe when shopping in Italy. The main cities for shopping are the main ones on any travel itinerary: Rome, Milan, Venice and Florence all offer the most prestigious designers and manufacturers in the world. Milan is without doubt one of the main centers for shopping in Italy and the numerous districts in the city provide nearly every consumer good you could imagine for sale – whether you are looking for high fashion, antiques, furniture or home accessories, shopping in Milan will provide it for you at any price. Fashion definitely trumps budget while shopping in Milan – so much that you’d think that the city gave away free money at its gates. Still, Milan can accommodate most any budget. There is enough variety in many of these boutiques such that you can easily take home a few reminders of your Italian vacation for a reasonable price. As one of the fashion capitals of the world it is only to be expected that its piazzas offer a wide assortment of leading designers. Armani, Gucci, Prada, Valentino and Versace all have stores within the city. 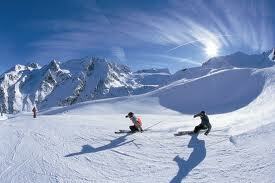 Skiing in Italy is a fine and quite recommendable pursuit. Admittedly the ski resorts here are not as famous as those in Switzerland and Austria, but they have a charm of their own. Skiing in Italy is sure to be a memorable experience. Skiing in Italy is sometimes like skiing in two different countries. German in prominent in the South Tyrol, and French in the Aosta Valley. Regional dialects and cultures vary along with food and wine. However, a consistent factor is the Italians’ innate hospitality and friendliness and their easygoing attitude toward life and the world. These facts make a great combination with a ski holiday mentality. Italy offers a diverse array of skiing options. There are areas where you can ski off into another country, duty-free skiing zones, year-round skiing and summer-only skiing. This is the time to consider Italy as a great ski destination. The northwest of Italy is among the best choices for ski holidays. Turin is one of the best budget airports. This town hosted the Winter Olympics in 2006. Valle di Susa is located west of Turin, near the Italian-French border. This valley offers a number of lively ski resorts, including Bardonecchia, Sauze d’Oulx and the trendy, modern Sestriere with elevation of 2035 m. Sestriere offers an ice rink, cross-country trails and 20 ski lifts. Bus transportation is available from Sestriere to Turin. To the north you will find the Aosta Valley, which has a distinct character and identity. Italian is also spoken here. You will be fascinated by the thick pine woods, wooden lodges and historical castles. Majestic mountains like Gran Paradiso, the Matterhorn and Monte Rosa tower over the area. The top-end, glamorous ski resort of Courmayeur is located here. It offers ice skating, ski lifts and cable cars, helicopter skiing, cross-country skiing and tons of downhill runs. Skiing is possible throughout the year. The resort nestles at the foot of the spectacular Mont Blanc. The Mediterranean hosts some of the most beautiful beaches in the world. Italy’s beach resorts attract more and more tourists year after year, for it is said the Italian beaches are like treasures to discover and behold. The beach resorts were home to many tourists during the summer season, today many now claim this their year round home. The wonders of sea air provide some of the healthiest fresh air, known for their regenerative properties; the sea air is a relief and a healthy escape from city life.Italy is a peninsula extending into the central Mediterranean Sea, northeast of Tunisia. Its 7,600 km of coastline have some of the most beautiful beaches in the Mediterranean, the Ligurian Sea, the Sardinian Sea and the Tyrrhenian Sea, in the west the Sicilian Sea, and the Ionian Sea in the south and the Adriatic Sea in the east. After exploring the cities, touring the lakes and walking in the mountains, the beaches are the perfect place to relax, unwind and reflect. Most of the year the beaches are sunny, and with 7,600 miles of shoreline bordering Italy and its islands, you can easily find waters where the temperatures are ideal for swimming. Miles upon miles of golden, sun drenched sand, in some places up to 1 km deep. The sea welcomes the sun seeker in comfort and style. An array of colours, which one can quickly identify by the rows of neatly laid out sun umbrellas and deck chairs, which seem to almost dot the entire seashore. Italy isn’t cheap, although compared with the UK and northern Europe the situation is not so bad. What you spend on accommodation (your single greatest expense) will depend on various factors, such as location (Turin is pricier than Taranto), season (August is crazy on the coast), the degree of comfort, and luck. At the bottom end you will pay €14 to €20 at youth hostels, where meals generally cost €9.50. The cheapest pensione (small hotel) is unlikely to cost less than €25 for a basic single or €40 for a double anywhere from Pisa to Palermo. You can stumble across comfortable rooms with their own bathroom from €50 to €80. Midrange hotels in the more expensive places such as Rome, Florence and Venice can easily cost from €80 to €150 for singles or €120 to €200 for doubles. The currency in Italy is the Euro. The Italian Lira was replaced in 2002, and now the Euro is the official Italian currency. You can convert US dollars to Euros at any bank during your visit to Italy. The currency exchange currently is 1.42 US dollars to 1 Euro.